We apply the “art of investing” to the many unmeasurables and unknowables we have to grapple with as we make decisions — this art is what allows us to make investments based on our faith in the growth of a new market and our confidence in a management team’s ability to navigate it. Intuition and instinct are indisputably important attributes of successful investors, but they need to be grounded in a foundation built of “processes” and “systems”, especially when building a track record of success over the longer term. Investors should take pride when they incorporate science into their work — to get a firm handle on operational metrics and create a solid foundation for strategic decision-making. And we ultimately enjoy the satisfaction that the science of investing is helping us improve our fund performance. We all know that the ultimate goal of an investment firm is to yield a targeted return on investment (ROI), which we do by investing in a portfolio of companies that will collectively yield or exceed that ROI. Operationally, we accomplish this by evaluating a stream of opportunities, which we typically call our “dealflow”, and then filtering them through a due diligence process to arrive at a series of investment decisions. Sourcing is essentially a marketing function, whose details go beyond the bounds of this article. The important point is that sourcing more deals doesn’t make sense if you don’t have the throughput to handle the increased volume. Deal processing is time-consuming, and your team is the bottleneck. The most up-to-date files and information are easy to identify, reducing avoidable errors and eliminating wasted search time. All deal team members can simultaneously and seamlessly access and contribute information — no more delays waiting for information requests between team members. Deal handoffs are easy, because all deal history and files are immediately accessible (this also lowers the risk and costs to the firm if a team member becomes suddenly unavailable). Routine tasks have very little overhead. Activities like logging a new deal, adding call notes, and preparing weekly pipeline reports should each take a trivial amount of time, given how many times a day we each need to do this. 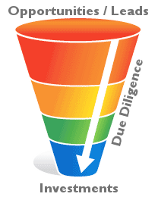 This ultimately involves less overhead and reduces errors, which then frees you up to handle the more important aspects of due diligence with greater care. The pitch: analyze more deals with higher-quality outcomes to achieve superior returns. But don’t stop there. How much does each source of dealflow contribute? (personal contacts vs other investors vs conferences vs news, etc.) What is the real quality of each of those sources, as judged by how far along their deals get in our pipeline? What are the measurable contributions made by each team member, in terms of sourcing deals, owning deals, and supporting teams? While ROI for each partner is the ultimate score, in the shorter run other indicators might be predictive of success. And you surely have more questions unique to your market. With a solid system in place you’ll be able to use dealflow analytics to actively support strategic decision-making. And just as importantly, if you have an advisory board or active limited partners, you can use well-grounded evidence to justify your strategic choices. If you’re operating without good systems and processes in place, your firm is not achieving its full potential — you’re wasting valuable time, under-utilizing your human capital, and making decisions in the dark. Contact us to discuss how we can apply our tools and experience to boost your firm’s operations.